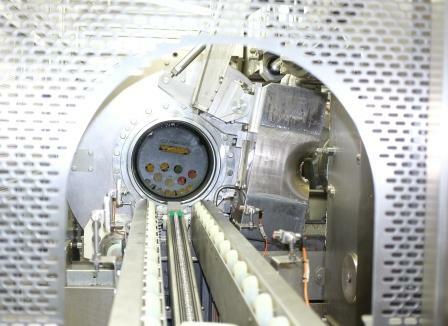 HPP processes liquid or solid foods, with or without packaging to extremely high pressures. This causes microbial cell death or damage. This makes High pressure processing an alternative processing method to control microbial growth in food. Correct Food Systems has considerable expertise with high pressure processing, applied to a range of products. Let us help you embrace this new technology. For some foods, HPP provides a good technology solution to processing challenges and therefore, is an excellent addition to a food technologist’s tool kit. High Pressure Processing (HPP) applies pressures between 100 and 800 MPa (14,500 to 116,000 PSI) to packaged or unpackaged foods. The pressure is so high it has the capability of damaging and destroying foodborne parasites, mould and yeasts, and vegetative pathogenic bacteria. Spore forming foodborne pathogens Clostridium botulinum, Clostridium perfringens and Bacillus cereus are more resistant. When HPP is combined with other process controls such as pH, water activity and temperature it can be an effective control and extend the safety and shelf life of products. HPP needs to be used wisely and with an appreciation of the limitations of the technology. Here is a simple article published by the NSW Food Authority Foodwise magazine February 2016. HHP- is it right for your business? NSW Food Authority has published an paper to assist businesses wishing to explore the suitability of HPP. (January 2016). The NSW Food Authority approved the use of this technology to produce "cold pressed milk" in June 2016. See our news blog story on 09/06/2016. 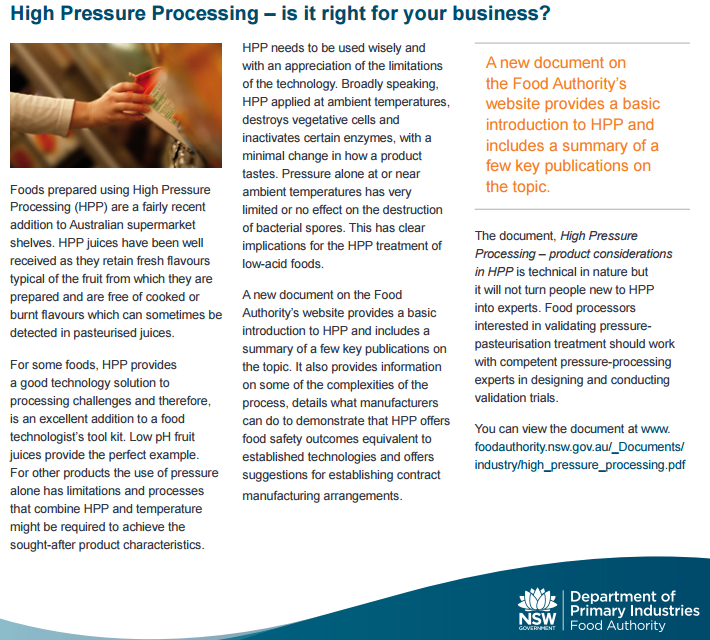 The paper "Product Considerations in HPP" provides some information on HPP, and is available form the NSW Food Authority website, or download here. Correct Food Systems has experience in working with a number of businesses who use High Pressure Processing. We can assist you with initial enquiries and development of a suitable food safety program, and some validation trials of HHP processing with your products.